Sony KDL-32EX713 review | What Hi-Fi? Sony's EX713 range got off to a stuttering start in our Awards 2010 issue. The 40in version received a lukewarm, three-star rating that was, in large part, down to inconsistent backlighting – an issue that Sony appeared to have tamed in its most recent flatscreen sets. We are, therefore, a little nervous as to how the 32in version will fare. 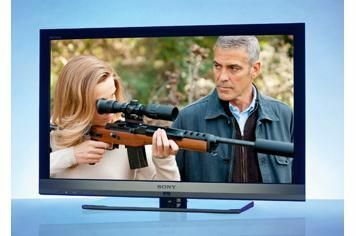 As you'd expect from a Sony television, the EX713 looks stylish and sophisticated. Compare and contrast with the Sony KDL-32EX503, and you'll see a slightly thinner bezel. Look even closer and you'll notice that the EX713 sports a little rectangular blemish beneath the Sony logo. This Presence Sensor can detect any motion in the room and can turn the TV off after a certain period of time – and then back on as soon as someone re-enters the room. Think of it as TV wizardry. It's when they are looked at side-on that the two Sony TVs reveal their biggest differences. And that's down to the EX713's edge-lit LED backlight. It means that the set's depth is reduced by more than 3cm, which makes wall-mounting all the more enticing. As is the case with the EX503, socketry is plentiful and includes four HDMI inputs. There's also USB connectivity, DLNA certification and you can access Sony's Bravia Internet Video online service at the touch of a button. The chunky, wide-boy remote is the same unit supplied with both Sonys, and the spacious, finger-friendly button layout works exceptionally well with the TV's XrossMediaBar menu system. If there was any anxiety over the TV's backlight, those fears are laid to rest once the TV's picture settings have been tweaked. There's no major trace of backlight bleed, which is good news for the viewer – not to mention black levels, contrast and shadow detail. The Sony excels in each of these departments; the set provides a fantastic insight into the dark, moody lighting of the Solomon Kane Blu-ray. The resolution on Solomon's clothing is superb, as is the TV's ability to differentiate between different shades of black and bring out detail in the darkest of scenes. Like the EX503, this set also features Sony's 100Hz Motionflow technology and it treats tricky pans and fast moving action scenes with the same finesse as its cheaper sibling. The image lacks a little clarity and vividness compared with the Panasonic TX-L32D25 but it's still very good. Freeview HD performance is of a similar ilk. Despite the mind-numbing effects of an episode of Deal Or No Deal on Channel 4HD, you can't help but be impressed by the sharpness, and superb colour balance that the Sony displays. Were it not for the presence of the Panasonic TX-L32D25 and the fact that the Sony is the more expensive than its rivals, then you'd be looking at a five-star verdict. As it is, the EX713 has to make do with a more than respectable four stars.